It'll make you laugh like Jeff Goldblum. I’ll be honest: Lego Jurassic World is the first Lego game I’ve finished in quite a while now. Probably since 2012’s Lego Lord of the Rings. And that’s because in broad swathes all of these games are exactly the same—take a beloved series, convert the characters (and some of the scenery) into Lego bricks, then punch things apart and pick up about a million different collectibles. If it sounds like I’m down on the series, I’m really not. 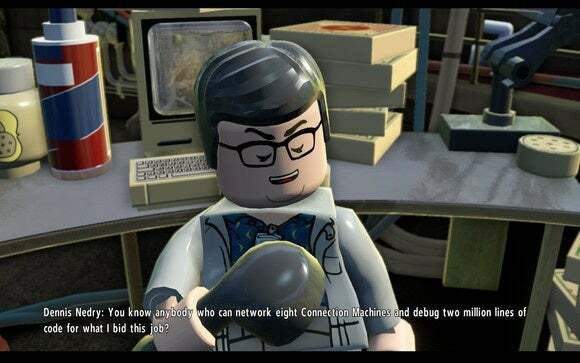 Even the worst Lego game is about a billion times better than most of the licensed tripe I played as a kid—major exceptions made for Spider-Man 2, Cool Spot, and GoldenEye. But it’s a known quantity, and a repetitive one at that. One made primarily for kids, and maybe parents. You have to be really enamored with the source material to want to play a Lego game. The moral of Lego Jurassic World: Never underestimate my affinity for Lego-fied dinosaurs. Despite the title, Lego Jurassic World in fact covers all four of the Jurassic Park films. Yes, even the bad one. The most amazing thing about Lego Jurassic World is it manages to make a halfway decent game out of what’s really one fantastic film, two decent follow-ups, and the giant pile of bargain-basement celluloid known as Jurassic Park III. 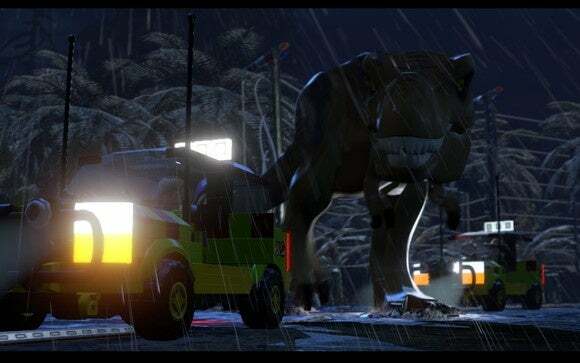 Lego Jurassic World even manages to turn Jurassic Park III into something if not amazing at least engaging—and really, that’s all we can ask. Anything more and we’d be talking about a legitimate earthly miracle, on par with turning water into wine. Key to the process? Dinosaurs. Enormous Lego dinosaurs. And some smaller Lego dinosaurs. I predicted this would be the highlight of Lego Jurassic World in my preview at GDC, and I was right. 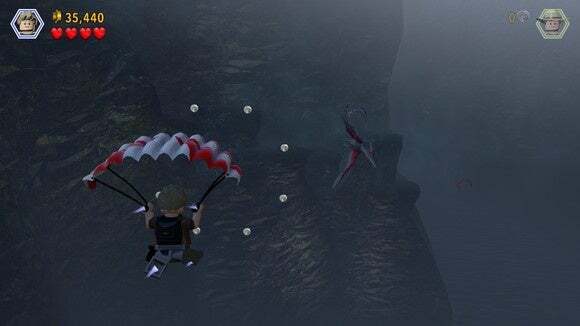 Each level in Lego Jurassic World contains a hidden “Piece of Amber.” Find this collectible and you then unlock the ability to spawn dinosaurs into the hub world in preordained paddocks or—in the case of certain smaller dinosaurs—even take them into the story levels as free-play characters. You can also embody Dr. Wu and customize the dinosaurs in question, changing their color schemes or creating new dinosaurs by (for example) swapping a triceratops head onto a velociraptor body. And then you can make the dinosaurs fight. 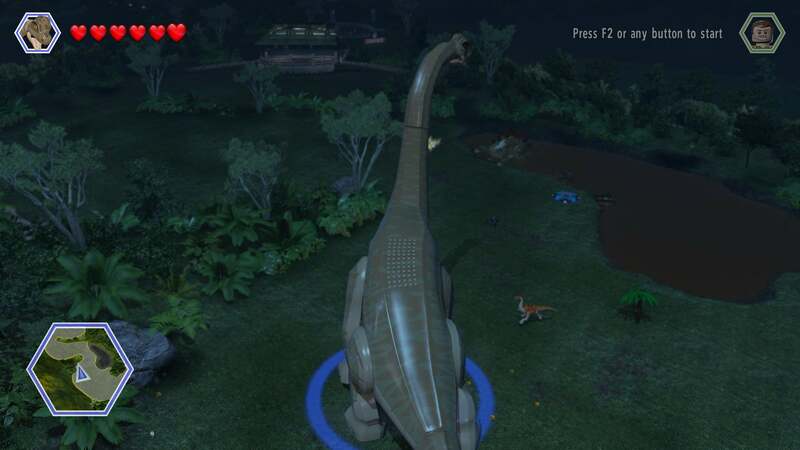 Truth be told, that’s really the standout feature/gimmick in Lego Jurassic World—but it’s a good one. The range of dinosaurs is pretty astounding too. You can play as the miniscule Compsognathus, which is about the size of a chicken. On the other hand you can play as an Brachiosaurus, which is literally so big that it breaks the game’s (pitiful) draw distance. Aside from that, it’s a pretty standard Lego game. The hub world this time is in fact four separate hub worlds, one for each game. Of the four, it’s clear that the most time went into designing Lego Jurassic World—probably not a huge surprise, given the title. It’s the only one that feels lively though, with the other three hubs feeling…well, like deserted jungle islands. Shocker. 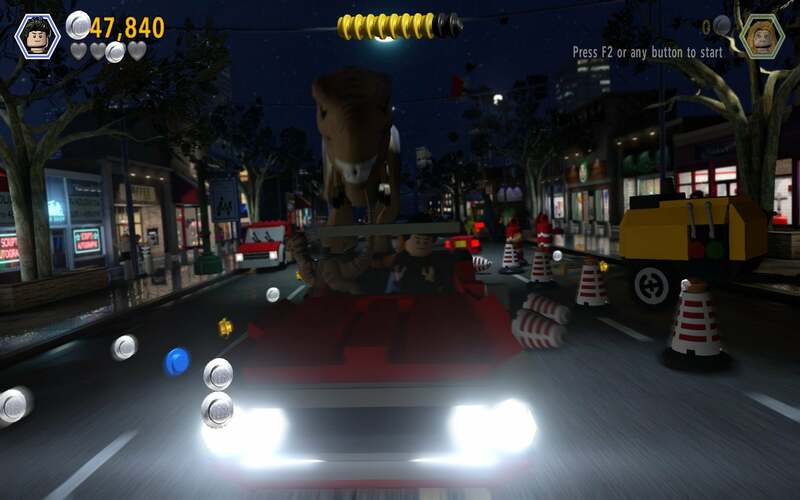 The game is also remarkably short for a Lego game, considering it covers all four films. I clocked about twelve hours, and that included quite a significant amount of messing around in the hub. Of course, we can attribute some of that to the fact that hardly anything happens in the second and third films. Especially the third film, where it seems like Traveller’s Tales really had to stretch to make a dismal plot into a semi-coherent game. That being said, I laughed a fair few times. Jeff Goldblum is especially hilarious, with Traveller’s Tales taking quite a few shots at the “unique” Dr. Malcolm. The infamous Jurassic Park laugh/giggle/purr even makes an appearance in the title screen, which is great. I also developed a soft spot for Mr. DNA, who steps in for the game’s tutorials and provides random dinosaur facts in the loading screens. It’s a great use of the source material. Less great: The dialogue is occasionally terrible—and I don’t just mean the writing itself. Lego Jurassic World continues the Lego trend of lifting lines directly from the films. The good? It sounds just like Jurassic Park. The bad? Sometimes those lines are of iffy audio fidelity. I’ve noticed the same in Lego Lord of the Rings, Lego The Hobbit, and the like, but it’s doubly noticeable in Lego Jurassic World where every line is seemingly accompanied by leaves rustling and dinosaurs growling. And even less great: Traveller’s Tales continues to pump out some of the most middling PC ports of the modern era. I’m starting to wonder how much of this I can ascribe to the developers and how much I should ascribe to WB, considering it’s the same flaw that afflicted Batman: Arkham Knight and Mortal Kombat X. The PC port quality is on par with Jurassic Park III. Actually, I take that back. That’s too mean. But it’s close. The game runs, sure—and runs well after tweaking. But it points to a certain lax approach to PC porting that I’m not sure I’m comfortable with. And it's one I hope the devs fix soon. Lego Jurassic World is neither the most ambitious of the Lego games (that honor goes to Lord of the Rings) nor the most polished (Marvel Super Heroes). But Lego dinosaurs. If those words get you excited, great—I recommend you look into Lego Jurassic World for a few hours of dumb, mindless collectible-hunting and light puzzle solving. If they don’t get you excited, give this one a miss. With this series, it really is that simple. 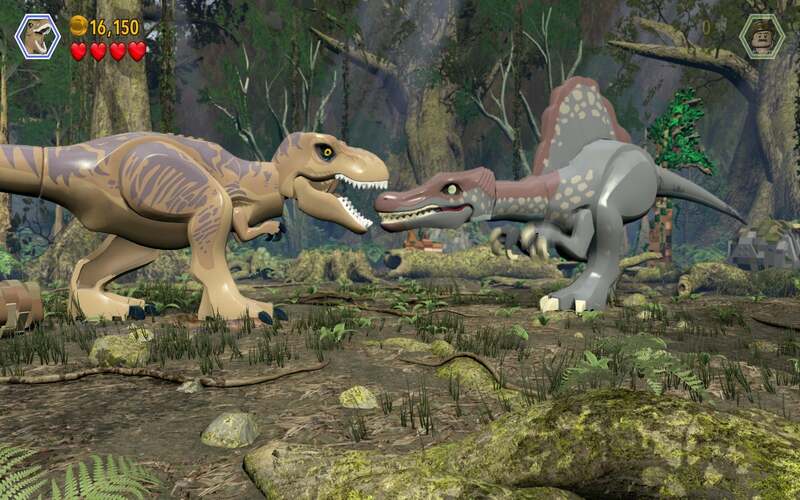 It's not the most ambitious Lego game ever made, but you can make dinosaurs fight other dinosaurs. And really that's all that matters.